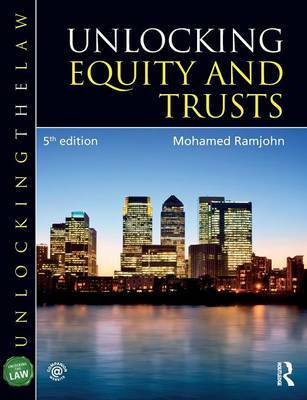 Unlocking Equity and Trusts will help you grasp the main concepts of Equity and Trusts with ease. Containing accessible explanations in clear and precise terms that are easy to understand, it provides an excellent foundation for learning and revising. This edition has been updated to include a brand new chapter on equitable remedies, an expanded chapter on fiduciaries and extended coverage of tracing. It also discusses recent developments in the law such as the Trusts (Capital and Income) Act 2013, the Supreme Court decision in Futter on the Rule in Re Hastings Bass, and the amended Public Benefit guidance issued by the Charity Commission. The books in the Unlocking the Law Series get straight to the point and offer clear and concise coverage of the law, broken-down into bite-size sections with regular recaps to boost your confidence. They provide complete coverage of both core and popular optional law modules, presented in an innovative, visual format and are supported by a website which offers students a host of additional practice opportunities. Visit www.unlockingthelaw.co.uk for access to free study resources, including multiple choice questions, key questions and answers, revision mp3s and cases and materials exercises.